A burglar who broke into an FA Cup-winning footballer's home has been jailed for five years. Luke Stuttard, 29, stole a car and jewellery from former Ipswich Town player Mick Lambert in January. He was jailed at Ipswich Crown Court after admitting one count of burglary. Twelve other burglaries were taken into consideration, including Mr Lambert's. Mr Lambert initially thought his 1978 FA Cup winner's medal had been stolen, but he later found it under his bed. The midfielder, now aged 68, came on a substitute for Roger Osborne, who scored the only goal in the victory over Arsenal at Wembley Stadium. 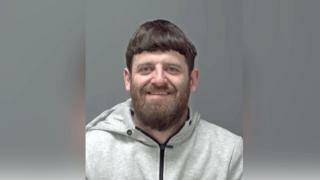 Stuttard, of Hogarth Road, Ipswich, was arrested following a burglary in Medway Road in the town on 13 January when a patio door was smashed and key stolen from inside. After being charged on 25 January, he was interviewed by police and admitted 12 other offences, including the burglary at Mr Lambert's house. Stuttard's crimes took place between 3 January and 23 January, and resulted in £60,000 of items being stolen and £14,000 of damage. One of these was at Mr Lambert's home in Ipswich on 18 January, when a Ford Fiesta, a TV and jewellery was stolen. The day before Stuttard had broken into a house in Belstead, near Ipswich, and stolen jewellery and a Mercedes E220. Det Con Duncan Etchells said: "Hopefully the sentence given in this case will provide some peace of mind to Stuttard's victims and also act as a deterrent to other would-be burglars."